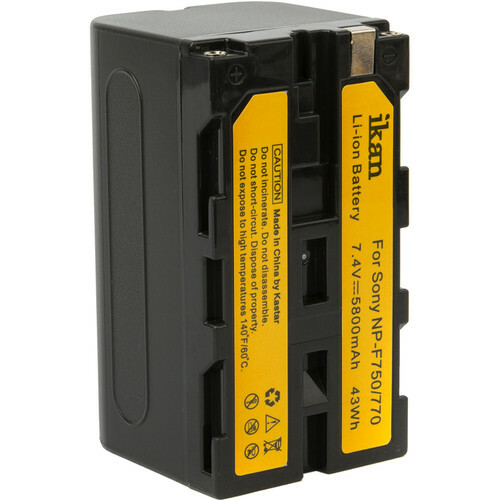 The NP-F750 L-Series Compatible Lithium-Ion Battery from ikan features a 7.4V output and 5800mAh capacity. It can be used with any device that accepts NP-F750 batteries. Compatible ikan devices include the iLED6, iLED144, iLED312 (-v2), ID508, and IB508. Box Dimensions (LxWxH) 3.0 x 2.05 x 1.55"
NP-F750 L-Series Compatible Battery (7.4V, 5800 mAh) is rated 4.8 out of 5 by 10. Rated 5 out of 5 by Gus C. from Great addition This extra capacity battery is a must for interviews. Don't let your lights die during an interview. Rated 5 out of 5 by Anthony from Works as it should Perfect replacement battery. Holds a good charge, works well. Rated 4 out of 5 by Rick Knight from Great Battery for LED Lighting & Monitors I used this battery on my?smallHD 702 Bright Monitor today and was totally surprised that it lasted a over 3 hours. ?The only reason I didn't give this battery 5 stars is because my?smallHD 702 Bright Monitor was unable to read the battery level... but my?Watson DUO LCD Charger did. Rated 5 out of 5 by Brian from Great Battery This battery lasts for several hours on my LED lights when I'm recording interviews. Rated 4 out of 5 by Mark A. from Good replacement Good charge... doesn't last as long as others, but didn't expect it too. Rated 5 out of 5 by David from Works Works for Atomos Ninja Inferno. Will this work as a replacement for the battery that comes with the smallHD focus (NP-F760)? The 760 is 7.4V but 0460 mAh. Will this work with Aputure Amaran AL-528S LED light? The Aputure Amaran AL-528S LED light takes the Sony L type batteries.